Most dental offices offer Nitrous Oxide, otherwise known as laughing gas, as an option during dental treatment, but the majority of those offices charge for the use of the gas. 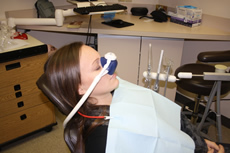 In our office, you will be given the option to use Nitrous during treatments and cleanings at NO CHARGE to you! We feel that it’s very important to offer our patients comfort during treatment in a relaxing atmosphere. We also offer noise canceling headphones to listen to music and the special paw of one of our therapy dogs to hold your hand through the entire process if you would like. Nitrous is very safe. It has very few side effects and the drugs used have no ill effects on the heart, lungs, liver, kidneys, or brain. How will nitrous make me feel? Nitrous can be a great tool to relieve dental anxiety and fear. We feel that it’s important for all of our patients to feel comfortable here in our office and are more than happy to provide you with Nitrous Oxide during your dental treatment FREE OF CHARGE! Previous post: Why are my teeth sensitive?